Very large self-supporting wooden roof. Built for the world fair in the year 2000, Hanover, Germany. 75 Unit Apartment building, made largely of wood, in Mission, British Columbia. Engineered wood, also called composite wood, man-made wood, or manufactured board, includes a range of derivative wood products which are manufactured by binding or fixing the strands, particles, fibres, or veneers or boards of wood, together with adhesives, or other methods of fixation to form composite materials. These products are engineered to precise design specifications which are tested to meet national or international standards. Engineered wood products are used in a variety of applications, from home construction to commercial buildings to industrial products. The products can be used for joists and beams that replace steel in many building projects. Flat pack furniture is typically made out of man-made wood due to its low manufacturing costs and its low weight. Densified wood is made by using a mechanical hot press to compress wood fibers and increase the density by a factor of three. This increase in density is expected to enhance the strength and stiffness of the wood by a proportional amount. Early studies confirmed this ends with a reported increase in mechanical strength by a factor of three. More recent studies have combined chemical process with traditional mechanical hot press methods to increase density and thus mechanical properties of the wood. In these methods, chemical processes break down lignin and hemicellulose that is found naturally in wood. Following dissolution, the cellulose strands that remain are mechanically hot compressed. Compared to the three-fold increase in strength observed from hot pressing alone, chemically processed wood has been shown to yield an 11-fold improvement. This extra strength comes from hydrogen bonds formed between the aligned cellulose nanofibers. The densified wood possessed mechanical strength properties on par with steel used in building construction, opening the door for applications of densified wood in situations where regular strength wood would fail. Environmentally, wood requires significantly less carbon dioxide to produce than steel and acts as a source for carbon sequestration. Particle board is manufactured from wood chips, sawmil shavings, or even sawdust, and a synthetic resin or other suitable binder, which is pressed and extruded. Oriented strand board, also known as flakeboard, waferboard, or chipboard, is similar but uses machined wood flakes offering more strength. Particle board is cheaper, denser and more uniform than conventional wood and plywood and is substituted for them when cost is more important than strength and appearance. A major disadvantage of particleboard is that it is very prone to expansion and discoloration due to moisture, particularly when it is not covered with paint or another sealer. Oriented strand board (OSB) is a wood structural panel manufactured from rectangular-shaped strands of wood that are oriented lengthwise and then arranged in layers, laid up into mats, and bonded together with moisture-resistant, heat-cured adhesives. The individual layers can be cross-oriented to provide strength and stiffness to the panel. However, most OSB boards are delivered with more strength in one direction. The wood strands in the outmost layer on each side of the board are normally aligned into the strongest direction of the board. Arrows on the product will often identify the strongest direction of the board (When bought in most cases the height (The longest dimension) of the board). Produced in huge, continuous mats, OSB is a solid panel product of consistent quality with no laps, gaps or voids. OSB is delivered in various dimensions, strengths and levels of water resistance. Laminated veneer lumber (LVL) is produced by bonding thin wood veneers together in a large billet. The grain of all veneers in the LVL billet is parallel to the long direction. The resulting product features enhanced mechanical properties and dimensional stability that offer a broader range in product width, depth and length than conventional lumber. LVL is a member of the structural composite lumber (SCL) family of engineered wood products that are commonly used in the same structural applications as conventional sawn lumber and timber, including rafters, headers, beams, joists, rim boards, studs and columns. Cross-Laminated Timber (CLT) is a versatile multi-layered panel made of lumber. Each layer of boards is placed cross-wise to adjacent layers for increased rigidity and strength. CLT can be used for long spans and all assemblies, e.g. floors, walls or roofs. CLT has the advantage of faster construction times as the panels are manufactured and finished off site and supplied ready to fit and screw together as a flat pack assembly project. Parallel strand lumber (PSL) consists of long veneer strands laid in parallel formation and bonded together with an adhesive to form the finished structural section. A strong, consistent material, it has a high load carrying ability and is resistant to seasoning stresses so it is well suited for use as beams and columns for post and beam construction, and for beams, headers, and lintels for light framing construction. PSL is a member of the structural composite lumber (SCL) family of engineered wood products. Laminated strand lumber (LSL) and oriented strand lumber (OSL) are manufactured from flaked wood strands that have a high length-to-thickness ratio. Combined with an adhesive, the strands are oriented and formed into a large mat or billet and pressed. LSL and OSL offer good fastener-holding strength and mechanical connector performance and are commonly used in a variety of applications, such as beams, headers, studs, rim boards, and millwork components. These products are members of the structural composite lumber (SCL) family of engineered wood products. LSL is manufactured from relatively short strands—typically about 1 foot long—compared to the 2 foot to 8 foot long strands used in PSL. The finger joint is made up of short pieces of wood combined to form longer lengths and is used in doorjambs, mouldings and studs. It is also produced in long lengths and wide dimensions for floors. I-joists and wood I-beams are "I"-shaped structural members designed for use in floor and roof construction. An I-joist consists of top and bottom flanges of various widths united with webs of various depths. The flanges resist common bending stresses, and the web provides shear performance. I-joists are designed to carry heavy loads over long distances while using less lumber than a dimensional solid wood joist of a size necessary to do the same task . As of 2005, approximately half of all wood light framed floors were framed using I-joists . Roof trusses and floor trusses are structural frames relying on a triangular arrangement of webs and chords to transfer loads to reaction points. For a given load, long wood trusses built from smaller pieces of lumber require less raw material and make it easier for AC contractors, plumbers, and electricians to do their work, compared to the long 2x10s and 2x12s traditionally used as rafters and floor joists. Transparent wood composites are new composites made at the laboratory scale that combine transparency and stiffness. They are not available yet on the market. Engineered wood products are versatile and available in a wide variety of thicknesses, sizes, grades, and exposure durability classifications, making the products ideal for use in unlimited construction, industrial and home project application. Engineered wood products are designed and manufactured to maximize the natural strength and stiffness characteristics of wood. The products are very stable and some offer greater structural strength than typical wood building materials. Glued laminated timber (glulam) has greater strength and stiffness than comparable dimensional lumber and, pound for pound, is stronger than steel. Some engineered wood products offer more design options without sacrificing structural requirements. Engineered wood products make more efficient use of wood. They can be made from small pieces of wood, wood that has defects or underutilized species. Wooden trusses are competitive in many roof and floor applications, and their high strength-to-weight ratios permit long spans offering flexibility in floor layouts. Engineered wood is felt to offer structural advantages for home construction. Sustainable design advocates recommend using engineered wood, which can be produced from relatively small trees, rather than large pieces of solid dimensional lumber, which requires cutting a large tree. They require more primary energy for their manufacture than solid lumber. The adhesives used in some products may be toxic. A concern with some resins is the release of formaldehyde in the finished product, often seen with urea-formaldehyde bonded products. Cutting and otherwise working with some products can expose workers to toxic compounds. Some engineered wood products, such as those specified for interior use, may be weaker and more prone to humidity-induced warping than equivalent solid woods. Most particle and fiber-based boards are not appropriate for outdoor use because they readily soak up water. Plywood and OSB typically have a density of 550 - 650 kg/m3 (35 to 40 pounds per cubic foot). For example, 1 cm (3/8") plywood sheathing or OSB sheathing typically has a weight of 1 - 1.2 kg/m2 (1.0 to 1.2 pounds per square foot.). Many other engineered woods have densities much higher than OSB. The lamella is the face layer of the wood that is visible when installed. Typically, it is a sawn piece of timber. The timber can be cut in three different styles: flat-sawn, quarter-sawn, and rift-sawn. Keep in mind that each cut will give the board a different final appearance. Wood ply construction ("sandwich core"): Uses multiple thin plies of wood adhered together. The wood grain of each ply runs perpendicular to the ply below it. Stability is attained from using thin layers of wood that have little to no reaction to climatic change. The wood is further stabilized due to equal pressure being exerted lengthwise and widthwise from the plies running perpendicular to each other. Finger core construction: Finger core engineered wood floors are made of small pieces of milled timber that run perpendicular to the top layer (lamella) of wood. They can be 2-ply or 3-ply, depending on their intended use. If it is three ply, the third ply is often plywood that runs parallel to the lamella. Stability is gained through the grains running perpendicular to each other, and the expansion and contraction of wood is reduced and relegated to the middle ply, stopping the floor from gapping or cupping. Fibreboard: The core is made up of medium or high density fibreboard. Floors with a fibreboard core are hygroscpoic and must never be exposed to large amounts of water or very high humidity - the expansion caused from absorbing water combined with the density of the fibreboard, will cause it to lose its form. Fibreboard is less expensive than timber and can emit higher levels of harmful gases due to its relatively high adhesive content. An engineered flooring construction which is popular in parts of Europe is the hardwood lamella, softwood core laid perpendicular to the lamella, and a final backing layer of the same noble wood used for the lamella. Other noble hardwoods are sometimes used for the back layer but must be compatible. This is thought by many to be the most stable of engineered floors. Engineered wood flooring is mainly industrially fabricated in the form of straight edged boards, with milled jointing profiles to provide for interconnecting of the boards. Such manufacturing is most cost efficient but leaves an industrial looking surface. In nature, no straight lines exist; therefore there is a rising trend to modify the visual appearance to imitate it. In recent years, numerous producers have been taking on the challenge of adding more natural aesthetics. most common, cheapest, and not waterproof. yellow/brown, and commonly used for exterior exposure products. white, heat and water resistant, and often used in exposed surfaces in more costly designs. expensive, generally waterproof, and does not contain formaldehyde, notoriously more difficult to release from platens and engineered wood presses. A more inclusive term is structural composites. For example, fiber cement siding is made of cement and wood fiber, while cement board is a low-density cement panel, often with added resin, faced with fiberglass mesh. While formaldehyde is an essential ingredient of cellular metabolism in mammals, studies have linked prolonged inhalation of formaldehyde gases to cancer. Engineered wood composites have been found to emit potentially harmful amounts of formaldehyde gas in two ways: unreacted free formaldehyde and chemical decomposition of resin adhesives. When exorbitant amounts of formaldehyde are added to a process, the excess will not have any additive to bond with and may seep from the wood product over time. Cheap urea-formaldehyde (UF) adhesives are largely responsible for degraded resin emissions. Moisture degrades the weak UF molecules, resulting in potentially harmful formaldehyde emissions. McLube offers release agents and platen sealers designed for those manufacturers who use reduced-formaldehyde UF and melamine-formaldehyde adhesives. Many oriented strand board (SB) and plywood manufacturers use phenol-formaldehyde (PF) because phenol is a much more effective additive. Phenol forms a water-resistant bond with formaldehyde that will not degrade in moist environments. PF resins have not been found to pose significant health risks due to formaldehyde emissions. While PF is an excellent adhesive, the engineered wood industry has started to shift toward polyurethane binders like pMDI to achieve even greater water-resistance, strength, and process efficiency. pMDIs are also used extensively in the production of rigid polyurethane foams and insulators for refrigeration. pMDIs outperform other resin adhesives, but they are notoriously difficult to release and cause buildup on tooling surfaces. Some engineered products such as CLT Cross Laminated Timber can be assembled without the use of adhesives using mechanical fixing. These can range from profiled interlocking jointed boards, proprietary metal fixings, nails or timber dowels (Brettstapel - single layer or CLT). ^ a b A Guide To Engineered Wood Products, Form C800. Apawood.org. Retrieved on February 10, 2012. ^ Naturally:wood Engineered wood Archived May 22, 2016, at the Portuguese Web Archive. Naturallywood.com. Retrieved on February 15, 2012. ^ "Milestones in the History of Plywood" Archived July 17, 2011, at the Wayback Machine, APA – The Engineered Wood Association. Accessed October 22, 2007. ^ a b APA A glossary of Engineered Wood Terms. Apawood.org. Retrieved on February 10, 2012. ^ O., Erickson, E. C.; (U.S.), Forest Products Laboratory (1965). "Mechanical properties of laminated modified wood". ScholarsArchive@OSU. ^ Ashby, M. F.; Medalist, R. F. Mehl (September 1, 1983). "The mechanical properties of cellular solids". Metallurgical Transactions A. 14 (9): 1755–1769. doi:10.1007/BF02645546. ISSN 0360-2133. ^ Song, Jianwei; Chen, Chaoji; Zhu, Shuze; Zhu, Mingwei; Dai, Jiaqi; Ray, Upamanyu; Li, Yiju; Kuang, Yudi; Li, Yongfeng (February 2018). "Processing bulk natural wood into a high-performance structural material". Nature. 554 (7691): 224–228. doi:10.1038/nature25476. ISSN 1476-4687. PMID 29420466. ^ Ramage, Michael H.; Burridge, Henry; Busse-Wicher, Marta; Fereday, George; Reynolds, Thomas; Shah, Darshil U.; Wu, Guanglu; Yu, Li; Fleming, Patrick; Densley-Tingley, Danielle; Allwood, Julian; Dupree, Paul; Linden, P.F. ; Scherman, Oren (February 1, 2017). "The wood from the trees: The use of timber in construction". Renewable and Sustainable Energy Reviews. 68: 333–359. doi:10.1016/j.rser.2016.09.107. ISSN 1364-0321. ^ Corky Binggeli. (2013), "Materials for Interior Environments". 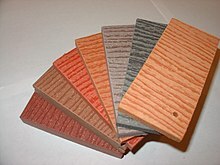 ^ Oriented Strand Board Product Guide, Form W410. Apawood.org. Retrieved on February 10, 2012. ^ a b APA – The Engineered Wood Association. Apawood.org. Retrieved on February 10, 2012. ^ FPInnovations Cross-Laminated Timber: A Primer. (PDF) . Retrieved on February 10, 2012. ^ "Why CLT? - X-LAM Alliance - Cross Laminated Timber CLT". ^ APA Structural Composite Lumber: A Practical Alternative. Apawood.org. Retrieved on February 10, 2012. ^ a b c Mary McLeod et al. "Guide to the single-family home rating". Austin Energy Green Building. HARSHITA p. 31-32. ^ APA – The Engineered Wood Association. Apawood.org. Retrieved on February 10, 2012. ^ a b Wood University. Wood University. Retrieved on February 10, 2012. ^ Naturally:wood engineered wood Archived May 22, 2016, at the Portuguese Web Archive. Naturallywood.com. Retrieved on February 10, 2012. ^ APA Engineered Wood and the Environment: Facts and Figures. Apawood.org. Retrieved on February 10, 2012. ^ Naturally:wood Engineered wood. Naturallywood.com. Retrieved on February 10, 2012. ^ "Engineered Floors Are Still Wood Floors". www.wagnermeters.com. Retrieved November 9, 2018. ^ "Weights of building materials -- pounds per square foot (PSF)". Boise Cascade: Engineered wood products. 2009. ^ 8800, National Industrial Chemicals Notification and Assessment Scheme, Level 7, 260 Elizabeth Street, Surry Hills NSW 2010. Phone: (02) 8577. "Formaldehyde in pressed wood products". www.nicnas.gov.au. Retrieved March 12, 2018. ^ "Interlocking Cross Laminated Timber Could Use Up Square Miles Of Beetle-Killed Lumber, and Look Gorgeous, Too". treehugger.com. ^ "Wohnen und Leben mit der Natur". soligno.com. ^ "Unsere Leistungen im Überblick". April 25, 2011. Wikimedia Commons has media related to Engineered wood.